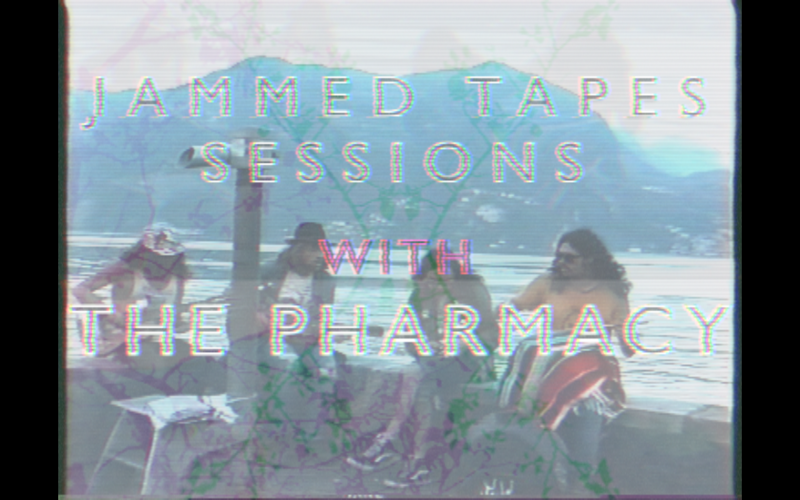 :: JAMMED TAPES SESSION :: THE PHARMACY (Part 1) – IS YOUR CLAM IN A JAM? The Pharmacy are about to release their fifth album, which sees them slightly veering away from the high energy garage they’ve been spewing out for the past 12 years and into more laid back psych soundscapes. A couple of weeks ago we met up in Lugano, Switzerland where they were playing Lugano Buskers Festival, a lakeside festival where stages were set up all around the Swiss town. In between their afternoon lakeside gig and their evening park gig we hung out together with two thirds of Night Beats (who were also playing the festival), drank weird beers called Kurt and The Dude and found a quiet spot by the lake where they played a few stripped down acoustic songs off their new album Spells, out on Old Flame records on August 12th, which you can pre-order HERE. On this first batch of videos (another two will be coming in a couple of weeks) you can watch lead singer Scott Yoder send off Neil Young vibes as he croons a modern tale of the corporate economic downturn in the premiere of Coat Tails, as well as the whole band playing Strange. Pingback: ::: JAMMED TAPES SESSION ::: THE PHARMACY (Part DEUX) | IS YOUR CLAM IN A JAM?